**Something that really annoys me whenever it pops into my head: what if the Flames had Andre Roy last season instead of Eric Godard? Roy is a 4th-liner at the end of his career, but he's ten times the player Godard is. He can take a pass, lift his head, make a good decision, and execute. Godard was 0/4 on that count, and he played 70+ games. Surely Roy would have been worth a couple more points, and thus a more favourable 1st round matchup? The 4th line's first shift last game was a faceoff against Thornton/Cheechoo/Michalek, and I wasn't even petrified. **What happens when Vandermeer is ready to come back? Is Pardy (or Giordano) going to revert to spot/PB duty? This can't happen, can it? The Flames have been lucky not to have any more D injuries while JV has been out, and 7 D is not too many, but I don't think that on merit you can make one of the present 6 a healthy scratch to make room for Vandermeer. That's what'll happen of course, but we'll see where things go from there. I mean, if you want to talk voodoo: the paid media seems pretty intent on looking at the waxing by San Jose as the turning point in the Flames season. Is there anything else that happened around that same time? Maybe, the guy with the worst numbers on the team getting injured, and replaced by someone who has proven to be more capable? **Also with injuries, I'm actually keen to get Primeau and Prust back healthy and available. Not sure what'll happen there either with the 4-line; early in the season, it looked to me like Prust might have passed Nystrom in value, but Nystrom has been pretty awesome on the PK and has probably cemented himself into the lineup. I assume Primeau would draw in in Roy's spot, but without Roy or Prust or Vandermeer, the Flames have no fighters at all, and we know the coach doesn't much care for that situation. Odds are that more injuries will dictate how that plays out. **No one really wants Craig Conroy as Jarome Iginla's full-time EV centreman, but it sure is damn nice to have him on the squad. Apparently some teams are hurting from the absence of a veteran RH centre (example), and I can see why. Jarome: he's still in his prime, but he's past his peak, which I hope doesn't sound too harsh. It's hard to deny what the EV stats say, which is that he's not driving possession and the scoring chance battle quite like he used to. Lots of terrific-to-good years left, though. Dion: he's not Robyn Regehr defensively, but most of his scary stats (the +/-, lack of goals) are some bad luck, and due to rebound. He still looks to me like he has plenty of energy (though I implore the coach to drop his TOI/game by another minute or two), and makes an awful lot more nice plays than WTF plays. Kipper: I'm still scared. George Johnson must be hepped up on goofballs to say that Kipper "has come on incredibly strong to push his GAA below 3.00 (2.86), save percentage over .900 and team to unexpected heights." Coming on strong to get your average up to a C doesn't get you on the honour roll, but forget that -- has he even been watching the games? We're not in 2005 anymore, Dorothy: the Flames outshoot and outchance the opposition almost every game, and the best thing you can say about Kipper is that lately he's been holding up his end of the bargain. McElhinney has looked at least as good in his select appearances; certainly enough so that using him every 5th game -- or at least using him religiously in the 2nd half of B2Bs -- would be indisputable sound strategy. **Dept. of Pleasant Surprises: Todd Bertuzzi has looked really good lately. Dec.12th vs. Florida: Bertuzzi looks like someone has read him the riot act, approximate content being, "The next time you skate over the other guy's blueline and make a backhand pass instead of shooting, you will be sitting behind McE for the rest of the game." He takes what seems like several shots that I can only describe at 'pissed-off sarcastic'. Got no results that game, but lo and behold: in games since, his decision-making calculus seems to have ruled out the worst of his ugly weak passes. I was going to write something about this on the weekend, but didn't have time before the Nashville game. Well into the 3rd period of that game, I'm thinking, "Thank God I didn't humiliate myself" -- he was beyond awful. And, then he goes and sets up the tying goal, then scores the winner with 23 seconds left. As if. But he looked pretty good Tuesday night, and against Chicago too. **First half MVP: Daymond Langkow. Sacamano used to refer to Reasoner, and then Pisani, as "Instant Chemistry", and that's totally what Langkow has been this year. There's not a player on the team who hasn't been better when on the ice with Langkow. I think he's owed 90+% of the credit for Bertuzzi's recent usefulness. The Flames have recorded 3 Shots on Goal for every 2 against while #22 is on the ice at EV, which is the kind of thing that works out very, very well in the long run. **Last thing: here is the "60 minute" records of the Western Conference teams as of Tuesday's games. 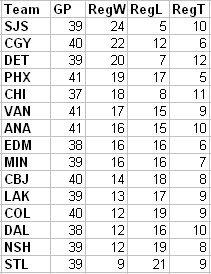 I have them sorted by regulation Ws, solely because a couple interesting things jump out (PHX and COL, most notably). Tonight the Flames host the 13-straight-road-losing New York Islanders (7PM MT, RSN West). Six people predict the final score at the Herald's website (freshly redesigned btw, and now either won't load or is the slowest page on the web, somehow -- kudos). Four of them say 5-1, along with a 5-2 and a 4-1. Short memories, I say. Almost exactly 1 year ago, the Isles came into the 'Dome as the much inferior team; were outplayed handily by the Flames for most of the game, and outshot by 17; and walked away with a 4-3 shootout Win. Any Given Thursday, and all that. I'm with the Borg that the Flames are the much better team and will have the better of the play, but I'll pick a final of Calgary 3 (Cammalleri, Phaneuf, Conroy), Islanders 2 (I really have no idea who plays for them and is presently healthy). Go Flames. Well, a good percentage of my talking points for the pregame post are covered here. And probably better. Wait, you mean you're still having Godard Remorse too? From the outside, hard to imagine Keenan cutting back on Phaneuf's TOI, since the guy always likes to run his top D-man like a mule. May your team be gentle tonight. I just like that you slipped the old Star Trek allusion in there. Also, if you're looking for Islanders who'll score, there's a bunch of ex-Oilers there, in Weight, Comrie, and Guerin; no Dvorak, sadly. Still, I'd pick Josh Bailey and Kyle Okposo as your scorers (failing them, Mark Streit is also pretty decent). The Oilers wouldn't be second last in the conference in regulation ties if MacT hadn't lost the room.